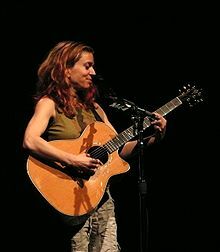 Ani DiFranco (born September 23, 1970) is an American guitarist and singer-songwriter. She has had over 20 albums. Her songs usually about feminism and political issues. Although DiFranco's music has been classified as both folk rock and alternative rock, she has created songs in many different music genres since her earliest albums. Her albums have used first punk, then funk, hip hop, and jazz influences. She was one of the first independent musicians to create her own record label (Righteous Babe). By creating her own record label, this has given her significant creative freedom. In 2012 DiFranco released her seventeenth album, ¿Which Side Are You On?. DiFranco was born in New York. She started doing classes at Buffalo State College when she was 16. DiFranco is bisexual. She lives in New Orleans with her husband. DiFranco has made two albums with Utah Phillips. DiFranco released her first album in 1990. After this she released a new album every year until 1997 when she did not release an album. In 1999 DiFranco released two albums. DiFranco has released three EPs. In 2013, people wrote posts on Twitter, Tumblr, etc., criticizing DiFranco after she said that she was going to hold a Righteous Retreat at Nottoway Plantation. On December 29, 2013 DiFranco cancelled the event.